Lauren has recently become enamored of the Food Network’s show that showcases eleven and twelve year olds in baking competitions. 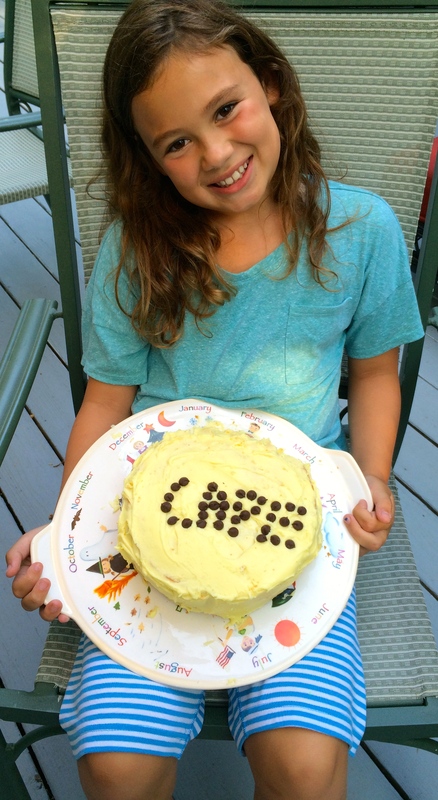 When they arrived on the cape this week for a visit, she unpacked her apron and said that she wanted to bake a cake. To be specific, a vanilla cake with yellow icing. I have a number of cake recipes, some of which are fairly complicated. But I was aiming for something simple that Lauren wouldn’t find overwhelming for her first venture, so I headed for the King Arthur Flour 200’th Anniversary Cookbook. This recipe for “Basic Butter Cake” is not only simple, it’s delicious. Every bit as good as some far more complicated recipes. She was justly proud of her finished cake, and we were all delighted to have it for dessert. 1. Preheat oven to 350. Grease and flour two 8″ cake pans. 2. Cream the softened butter and sugar with a mixer until light and fluffy. 3. Add the eggs, one at a time, mixing until they are fully incorporated. 5. Pour the milk into a measuring cup. Add the vanilla. 6. Add the flour mixture to the butter/sugar mixture alternately with the milk. Mix just enough to combine all of the ingredients. 7. Pour into the two prepared pans. Bake for approximately 30 minutes, until a tester comes out clean. Cool in the pans for about five minutes before turning out onto a rack to cool completely. 1, Melt butter in the microwave in a heat proof mixing bowl. 2. Using a mixer, add the powdered sugar, alternating with the milk, until you reach a spreading consistency. Add the vanilla during the last stages of mixing. 3. Put in the food coloring a few drops at a time until you’re happy with the color. 9. Frost when the cake is completely cooled. Lauren has her grandmother’s genes and talent. What great memories you are creating together!